Ask a Napa resident or a Napa seasoned tourist where to dine, and surely Zuzu will be on the list of recommended restaurants. From the outside, it may not look like much, but the food is authentic Spanish Tapas. Tapas are small plates of delicious flavored foods that include seafood, cheese, meats and veggies. 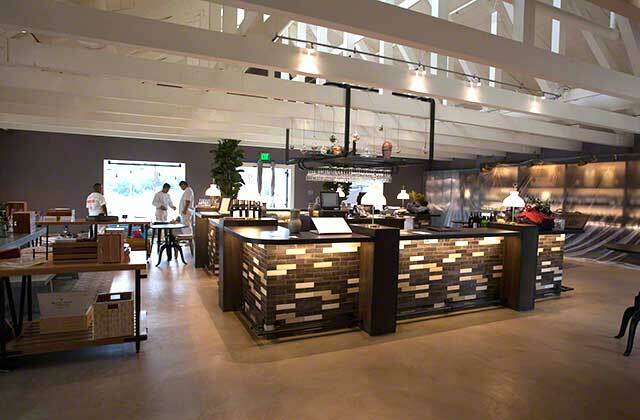 When we lodge in Napa, we are sure to have dinner at Zuzu at least one night. Not only is the food terrific, but you can also dine easily for under $100 a couple, and that includes a bottle of wine. All the ingredients are from local artisans and purveyors of fine food. Fresh food is the operative word at Zuzu. The restaurant does not take reservations so you may have to wait for a table, but it will be well worth it. For two people, order four tapas. We shared the Queso Frito, the Tortilla Español, a Paella for one, and the Monterey Squid and Morcilla Sausage a la Plancha. The wine list prices are reasonable and corkage is $15. How often does a Napa Valley restaurant charge $15 for corkage? Not often. Zuzu is a very down-to-earth restaurant, and it has the look and feel of a Tapas bar in Madrid, Spain. Warning, not for the swanky! The old downtown of Napa is changing. New lodging and dining establishments have brought a thriving tourist community to the area. Several exciting wine bars and tasting rooms are within easy walking distance of lodging. The old Copia building is now an extension of the Culinary Institute of America. A restaurant, a store and wine tasting classes are available to the public. The Oxbow Public Market is not to be missed. You will find Napa an excellent wine country destination. Michelin Bib Gourmand restaurants are dining spots Michelin has rated an excellent value. It is possible at these restaurants to be served two courses and a glass of wine or dessert for $40 or less before tax and tip. If you like excellent dining and good prices, take note of these restaurants in wine country. 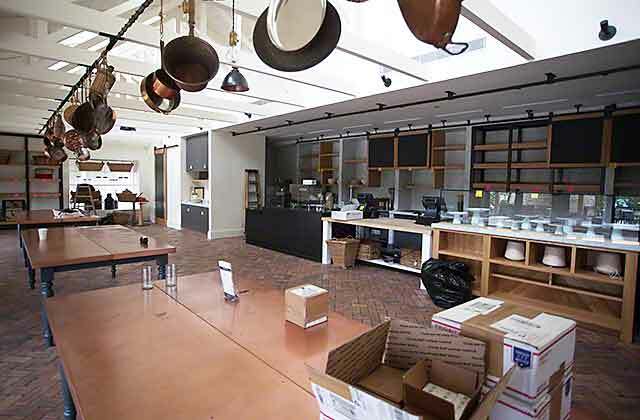 What new winery in the Napa Valley can boast that they have a restaurant, a bakery cafe & deli, extended tasting room hours, a separate merchandise store, and an event center for hosting weddings and corporate events? None, except for Cairdean Estate. Stacia and Ed Williams purchased 50 acres next to the old St. Helena Outlet Stores in 2010. The Outlet closed several years ago and when the property was recently put up for sale, Stacia and Ed jumped in and purchased that property. They applied for and received the existing Outlet business permits, allowing them grandfathered rights to build the Cairdean facilities. We toured the property last week, and we’re sure it will be an amazing wine and food complex. It will probably become the envy of many a Napa Valley winery and certain to be a popular destination for wine country enthusiasts. The Tasting room just received a fresh coat of paint. Sitting above all this and up against Spring Mountain is the winery. Although the facility will not be completed until early 2015, it should be ready for the 2014 Crush. 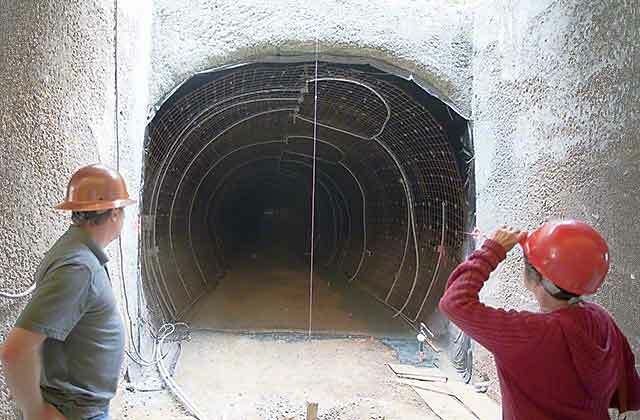 The 17,000 square feet of caves have been dug into Spring Mountain and will be the focal point of the winery. 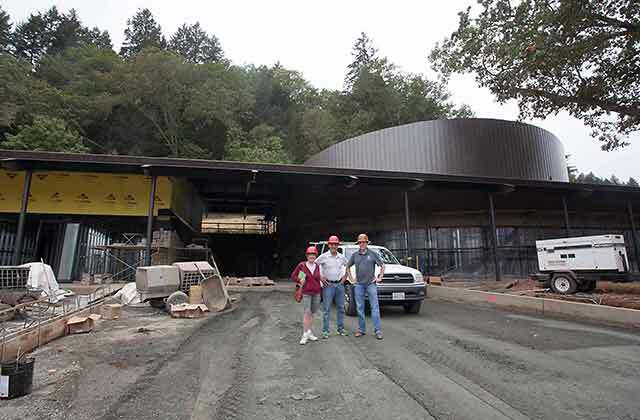 Another tasting room with glass walls and valley views will be located at the southern end of the winery. This tasting room will be used for tastings by appointment and, I assume, special guests. It is a stunning-looking winery even though it’s not complete. Oh yes, the roof will be “green,” as in plants. That will certainly be a cooling factor for the winery. The winery is capable of producing 50,000 gallons of wine per year. We did some wine tasting with Stacia and Ed. All previous vintages have been made at the Laird custom crush facilities in Napa. 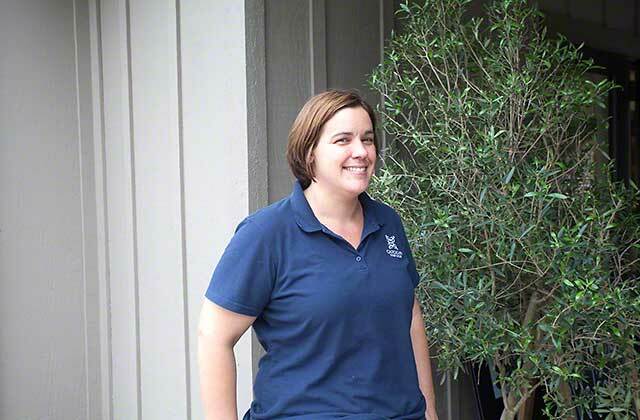 Stacia is the winemaker and Ed is the vineyard operations manager. They own two vineyards, one in the Russian River Valley, the other in Coombsville. The rest of the grapes are soured from various vineyards. Stacia makes several different wines; we counted 21 on the tasting list. We tasted six wines and, as you might guess, all were well made and delicious. Prices range from $22 to $88. We purchased the Russian River Valley Chardonnay, a medium-bodied Chardonnay nicely balanced with oak; The Carneros Pinot Noir, rich in spice and lush in the mouth; and a stunning (our favorite) Sangiovese from Atlas Peak that was layered with flavors. Cairdean is a Scottish Gaelic word that means “friends.” Cairdean Vineyards and Winery is sure to have plenty of friends once this entire project is completed. For the past four years, Dino Bugica has been running his little amazing Italian restaurant, Diavola Pizzeria & Salumeria, in the quiet town of Geyserville. When it first opened, few thought that this tiny town could support more than one upscale restaurant. The established and highly-regarded Santé restaurant was a few doors down, and Dino had been the head chef there. In just a short time, Diavola has become a very popular spot among the locals, as well as the workers and visitors to the nearby wineries of the Alexander Valley and the Dry Creek regions. We have been raving about this spot since it opened. Last week we organized a dinner at Diavola for our 8th annual WCG Bocce Tournament. 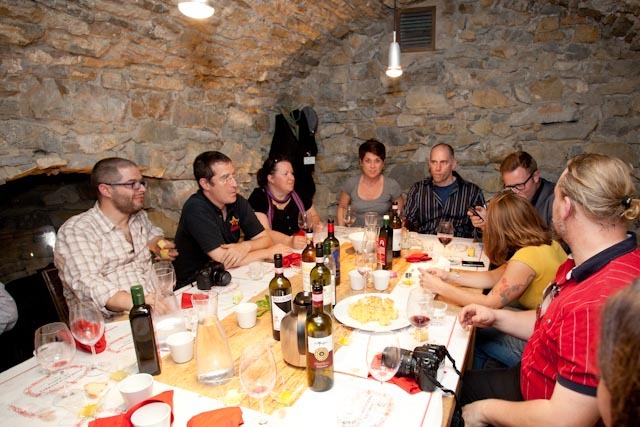 Sixteen of us wined and dined to our delight, devouring a variety of delicious foods prepared by Dino and his crew. We began our dinner with three orders of salami and cheese. The salami and sausages are house cured and wonderful. Then came the salad that was so amazingly good: The asparagus and egg salad has a lightly fried farm fresh egg, crispy pork belly, truffled pecorino and lemon vinaigrette. Oh, my! Dino working the pizza oven. Is Brian Wilson a fan? For the entrée, we had a mix of tasty pizzas and creative pasta dishes. The pasta with the slowly braised pork, beef, basil, and pecorino cheese was without a doubt the crowd’s favorite. In our dinner party of 16 we had one person with dietary restrictions, and for her, Dino whipped up a farm fresh arugula salad and the most awesome pizza a vegan has probably ever seen or tasted, for that matter. Ray says: I thought the food was authentic artisanal Italian with fresh ingredients. The restaurant itself had the feel of a bistro while the service was excellent and well paced. Mike says: Given the size of our group (number not weight) I thought the price was more than reasonable. They were very poised in their service and plates came at a good pace. I was most impressed by the individual style of each dish and how clear the flavors were displayed without any one flavor being dominant. Close your eyes and you could be in a country inn in Italy, the only thing missing was hearing Italian spoken. Comparing Diavola with other wine country restaurants, this is a clear winner. I highly recommend Diavola. Janelle says: The food is delicious and innovative, the place feels friendly, and the prices and service were good. The latest accolade for Diavola’s was the inclusion of this restaurant in the recent issue of the Wine Spectator magazine featuring the Sonoma County wine country. I’m not sure which will bring more business to the restaurant, this blog article or the full-page photo of a Diavola pizza in the Wine Spectator. Menu and other information can be found on the Diavola Website. If you want to visit wineries in the Geyserville area, we have a terrific wine trail to follow. Bring back a bottle of your favorite Geyserville wine to Diavola and enjoy a fabulous Italian feast. On Sunday, April 1, the San Francisco Chronicle Food Editor Michael Bauer came out with his annual list of Top 100 Restaurants in the San Francisco Bay Area. If you are planning a trip this year to wine country, you probably will want to consider dining at one of these fabulous wine country restaurants on Michael Bauer’s elite list. Thomas Keller has three restaurants on the list all in Yountville. Sometimes you just need a quick getaway to cure the doldrums of the winter months. And that is what we just did with a one-night getaway to Yountville in the Napa Valley. We booked a room at the Napa Valley Lodge for $149 at their special winter rate. The Lodge is very comfortable and within walking distance of the restaurants, tasting rooms, and lots of boutique shops. Although on this day it was grey and damp, it was a delight to drive along the Napa Valley floor and take in the beautiful scenery of the mountains and vineyards. We arrived just in time for our 12:30 lunch restaurant at Redd Wood, the newest restaurant in town, owned by Richard Reddington of Redd Michelin fame in Yountville. The restaurant is located in the North Block Hotel, formerly the Hotel Piero. 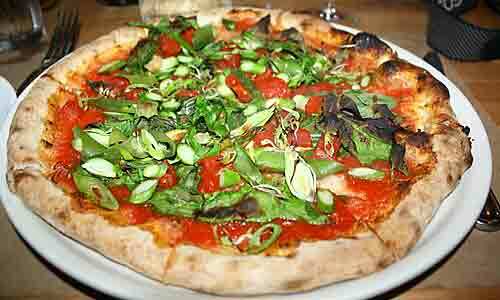 Redd Wood is a pizzeria with causal dining in a pleasant and relaxing atmosphere. The specialties, of course, are pizzas but there are many other menu items. There were four of us for lunch. Two shared a pizza and a salad and thought they were both just okay, nothing spectacular. Janelle and I shared a pear and wintergreens salad and a sandwich with rosemary foccacia, prosciutto cotto, and crucolo cheese. They were both excellent. The Sommelier was very cool, answering my questions about a few wine choices on his wine list, and recommended a Docellto/Barbera from Piedmonte in Italy that was very tasty, medium bodied, and perfect with our meals. The Wine list is good with a wine selection at $38 and above. 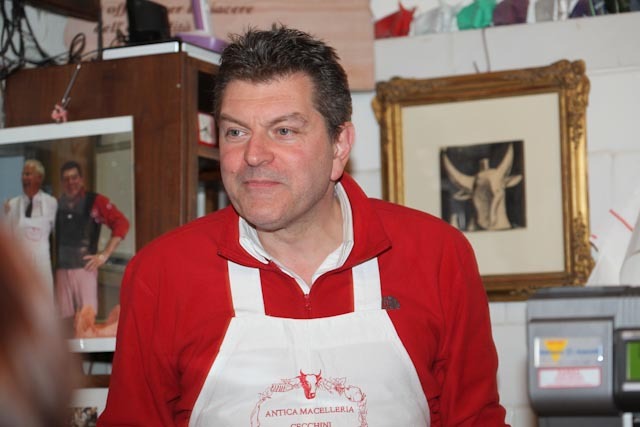 If you ever travel to Tuscany, don’t pass up the chance to dine at Dario Cecchini’s Solocicca restaurant and to visit to his butcher shop, Antica Macceleria. We can guarantee this will be one experience extraordinaire you will not soon forget. Before I left the U.S. to embark on my wine adventures in Italy, I watched YouTube videos of the famous butcher of Panzano in Chianti with utter fascination. We were to dine at his restaurant along with fellow wine bloggers and experience the “Whole Steer” dinner. I wasn’t really sure what that meant, so I watched the videos to mentally prepare myself. Dario Cecchini is an 8th generation butcher but he has taken his skill to another level from his predecessors. Not only does he have innovative ideas about his profession, but his amazing outgoing personality, and his love for his trade and the people that come to his butcher shop and restaurant, are what sets him apart. He is truly a living legend in the land of Chianti Classico. First we walked into Dario’s butcher shop directly across from the restaurant. The first thing that catches your attention is a mannequin with a human body but with the head of a steer. 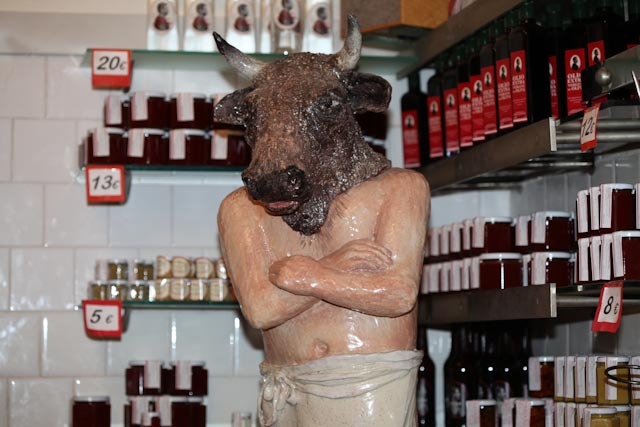 The steer head is eyeballing you as if to say “Hello” and welcome you to the butcher shop. A variety of meat appetizers are there to sample. Jug Chianti wine made by Dario is offered. Suddenly, the living legend appears behind the counter and with a loud and booming voice Dario shouts out: “To Beef or not to Beef, that is the question!” That’s Dario in a nutshell. The music is turned up and people begin to dance, it is an impromptu party like no other. The Whole Steer dinner is a menu of many beef items, all delectable, including a spicy meat ragu on toast, boiled beef with vegetable salad, and braised beef very tender and tasty. The “Whole Steer” menu consists of ten different items for 30 Euros per person. This is quite a reasonable price to pay for such an extraordinary meal. In San Francisco, I suspect something similar would be well above $50 per person. For an extra 3 Euros, you can get a liter of Dario’s jug wine, or you can bring in your own, and there is no corkage fee. Dario’s vision is to use the steer responsibly and to search for ways to use as much of the steer as is possible for food. In his shop and on his website, he has done something I have not seen before. He has created a diagram outline of the steer which maps the various parts of the steer he uses for each entrée on his restaurant menu or item he sells in this butcher shop. Dario makes several appearances at our table to toast us and to expound on his philosophy as a butcher. To say the least, he is quite an interesting person. We left very full of food, fun, and happiness and a night never to be forgotten. Check out this video of the impromptu party at Dario’s shop, Antica Macelleria in Panzano in Chianti. I don’t think you will find this same experience any time soon at your local butcher shop. In fact, I am showing this video to my local butcher and ask him if he could start serving wine and meat goodies while I shop.